The Doggie Diner sign is San Francisco's favorite beleaguered would-be landmark. In March 2000, the Board of Supervisors responded to a rally by members of the Ocean Beach Historical Society and others to save the kitschy sign after owner Sloat Garden Center went public with intentions to remove it from the spot it has occupied since the early '70s. The Board declined to make the fiberglass sign an official City landmark but agreed to assume ownership of it and to keep it in its original location outside the Carousel Restaurant until at least 2005. Barely more than a year under the care of City officials, the sign was knocked over during a gust of wind and fell onto Sloat Boulevard, mangling the pooch's nose. Horrified fans of the sign expressed disappointment that the city did not act sooner to repair the rusty 20-ft. pole on which the sign sat, despite their frequent requests and the availability of volunteer assistance from Painters Union Local 4. 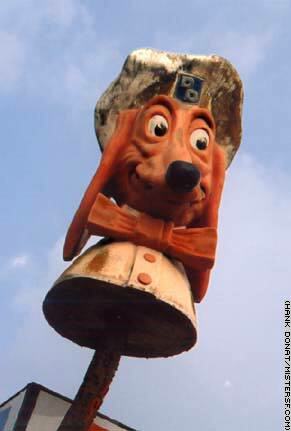 The Doggie Diner sign was repaired by the City and returned to its location on Sloat Boulevard on June 30, 2001. The sparkling refurbished sign is said to be very close to its original appearance. The huge head was one of many that once dotted the Bay Area at Doggie Diner fast food hot dog joints more than thirty years ago. For fans of the pup its appeal needs no explanation, rousing a sense of play and harking - or barking - back to carefree days of childhood. On Valentines Day in 2005, the sign was moved away from the land it marked at the diner, which was destined to be demolished by its owner, Sloat Garden Center, in favor of a bigger parking lot. San Francisco's Doggie Diner sign was installed several yards away, on the median strip near 45th Avenue, across the street from the entrance to the San Francisco Zoo.